Our hearts are a little broken, but we're all for Paulo and Jodie's new relationship! Paulo Avelino, age 29, has a new girlfriend, 22-year old Fil-Aussie model Jodie Elizabeth Tarasek, and the local Twitterverse is SHOOKT. But it's not as if Paulo isn't capable of being in a relationship. No, no. The wild (and intense) reaction is coming from people actually believing that Paulo should be in a relationship with them. 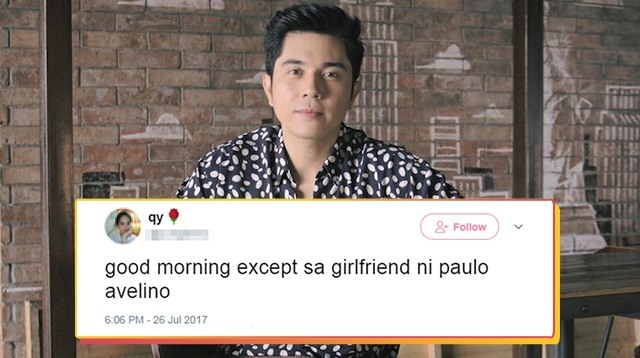 Read on to see the most hilarious tweets about Paulo getting a new girlfriend—from heartbroken fangirls to some who are passive aggressive AF. Paulo Avelino has a girlfriend... (and it's not Maja) ???? WHAT DOES THIS JODIE TARSIER GIRL HAVE THAT MAJA SALVADOR DOESN'T, HELLO PAULO AVELINO?? PAUMAJ ??? ?